Here’s one last intro for the spring season. 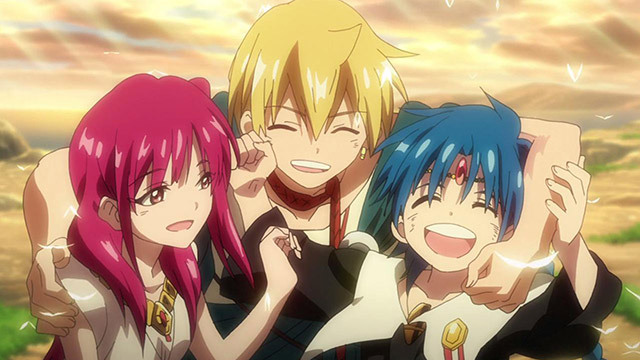 Continue Reading "Magi: Sinbad no Bouken – 01"
Happy endings are worth fighting for. After its first season, some said the Magi anime didn’t deserve the second season it was getting. If so, they made good of the chance they were given. From story to animation, character development to action, from heart-wrenching tragedy, complex villains, lots of Extreme Magic, and a climax that built on everything that came before it, the anime found redemption. This is a finale snapshot, so spoilers ahoy! Feel free to read if you don’t mind being spoiler though, because I just might convince you that you need to watch the second season. Continue Reading "Magi: The Kingdom of Magic – Redemption"
The time for celebration is short for our heroes–new individual journeys await. Continue Reading "Magi: The Kingdom of Magic – 01"
Continue Reading "Magi – 25 (END)"
How do you fight against a hopeless fate? Continue Reading "Magi – 23, 24"
So that’s where all the animation budget went! Continue Reading "Magi – 22"
That’s right! Tell those hippy tree-hugging djinns to get ou—woah woah, stop the waterfall display! Continue Reading "Magi – 21"
Continue Reading "Magi – 20"
Oh hey, this is a pretty funny episo—wait what!? Continue Reading "Magi – 19"
The wheels of fate continue to rush forward even between arcs, though our own band of heroes enjoy a “forced” rest in Sindria. Continue Reading "Magi – 18"
The Balbadd Arc has finally finished, bringing a wonderful close to the conflicts of Alibaba’s home. Continue Reading "Magi – 17"
Aladdin has come back back to finally reverse the reversals of flow. We’ve missed you, buddy. Continue Reading "Magi – 16"
There always has to be someone to screw things up…who just want to watch the world burn. Continue Reading "Magi – 15"
Alibaba has said something revolutionary. Well said Alibaba, I didn’t see it coming! Continue Reading "Magi – 14"
After a week-long break, welcome back to Magi, which is kicking the action into high gear, and the Morgiana into hngggh gear! Continue Reading "Magi – 13"